Take a break from the traditional neighborhood setting and discover the opulence of Myakka River Trails. Located on the eastern side of Venice and next to the Myakka State Park, you’ll find beautiful homes overlooking stretches of riverfront and natural Florida landscapes. It’s a perfect escape for those wanting to enjoy an outdoors lifestyle and still be in close proximity to the city. Residents love hiking through the park on the weekends, exploring the beautiful fields of flowers and counting the clouds in the sky. For people in Myakka River Trails, a real Florida experience is spending time outside while having a luxurious house to go home to. The Myakka River Trails has gained a lot of popularity due to the tracts of land for sale. Home buyers have the option of building custom houses among different lot sizes (ranging from 5-10 acres). 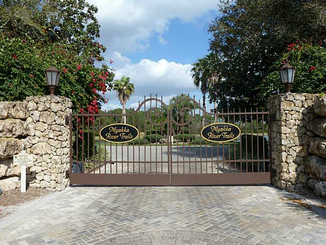 Properties sit along the Myakka River and are naturally guarded by lush nature preserves. You can listen to the palms rustling in the wind while hearing the calls of songbirds. You’ll feel the gentle breezes of the Florida weather from your back patio and enjoy sitting out to read a book. Constructed homes in Myakka River Trails offer spacious living areas, modern amenities, and luxurious master suites. For more information about homes for sale in Myakka River Trails, click the button below. As mentioned before, the outdoors plays a special role in the community. The Deer Prairie Creek and Myakka River State Park are popular places to go hiking along, camping in, and exploring. There are miles of trails to choose from, some specially dedicated to horses. If you’re looking for something center around the water, Venice has a number of beaches you can visit. Homeowners also love Myakka River Trails because of the local convenience to nearby shopping centers and delicious restaurants — the most famous of them being the Myakka River Oyster Bar. Shopping areas located near the neighborhood include: the Sweetbay Supermarket, Venice Pines Plaza, and the Wal-Mart Suprcenter. If you’d like more information about Myakka River Trails, send us your questions via our Contact page (click here). We’d be happy to discuss any concerns you might have! Medway Realty is Sarasota's most innovative real estate team. © 2019 My Florida Regional Multiple Listing Service, Inc. All rights reserved. All listings displayed pursuant to IDX. All listing information is deemed reliable but not guaranteed and should be independently verified through personal inspection by appropriate professionals. Listings displayed on this website may be subject to prior sale or removal from sale; availability of any listing should always be independently verified. Listing information is provided for consumers personal, non-commercial use, solely to identify potential properties for potential purchase; all other use is strictly prohibited and may violate relevant federal and state law. Data last updated 2019-04-22T16:43:05.197.